The Early Morning of the War: Bull Run, 1861, Edward Longacre, University of Oklahoma Press, 12 maps, 30 b/w illustrations, notes, bibliography, index, 648 pages, $29.95. From The Publisher: When Union and Confederate forces squared off along Bull Run on July 21, 1861, the Federals expected this first major military campaign would bring an early end to the Civil War. But when Confederate troops launched a strong counterattack, both sides realized the war would be longer and costlier than anticipated. First Bull Run, or First Manassas, set the stage for four years of bloody conflict that forever changed the political, social, and economic fabric of the nation. It also introduced the commanders, tactics, and weaponry that would define the American way of war through the turn of the twentieth century. This crucial campaign receives its most complete and comprehensive treatment in Edward G. Longacre’s The Early Morning of War. 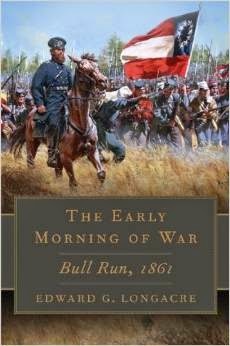 A magisterial work by a veteran historian, The Early Morning of War blends narrative and analysis to convey the full scope of the campaign of First Bull Run—its drama and suspense as well as its practical and tactical underpinnings and ramifications. Also woven throughout are biographical sketches detailing the backgrounds and personalities of the leading commanders and other actors in the unfolding conflict. Longacre has combed previously unpublished primary sources, including correspondence, diaries, and memoirs of more than four hundred participants and observers, from ranking commanders to common soldiers and civilians affected by the fighting. In weighing all the evidence, Longacre finds correctives to long-held theories about campaign strategy and battle tactics and questions sacrosanct beliefs—such as whether the Manassas Gap Railroad was essential to the Confederate victory. Longacre shears away the myths and persuasively examines the long-term repercussions of the Union’s defeat at Bull Run, while analyzing whether the Confederates really had a chance of ending the war in July 1861 by seizing Washington, D.C. Brilliant moves, avoidable blunders, accidents, historical forces, personal foibles: all are within Longacre’s compass in this deftly written work that is sure to become the standard history of the first, critical campaign of the Civil War. Edward G. Longacre is a retired U.S. Department of Defense Historian and the author of numerous articles and books on the Civil War and U.S. military history, including The Cavalry at Gettysburg, winner of the Fletcher Pratt Award, and Gentleman and Soldier: A Biography of Wade Hampton III, recipient of the Douglas Southall Freeman History Award. Gettysburg National Military Park staff returned the granite Battery F, 5th US Artillery monument to its original location, within the footprint of the old Cyclorama building in Ziegler's Grove, today, September 24. The monument was moved from its original location in the early 1960s to make way for the construction of the Cyclorama building. Now that the demolition of the cyclorama building is complete, funded by the Gettysburg Foundation, the monument has been returned to its original location. Since 2009 Gettysburg National Military Park and the Gettysburg Foundation have been returning key portions of the center of the Union battle line on North Cemetery Ridge to their appearance at the time of the Battle of Gettysburg, 1863. Completed phases include the demolition of the old visitor center in 2009; the planting 41 apple trees to reestablish the Frey orchard (North) in 2010; the removal of the former Visitor Center parking lot in 2013 and the demolition of the Cyclorama building in 2013. The Gettysburg Foundation is now raising funds for changes to the National Cemetery parking lot which would allow the replanting of missing portions of Ziegler's Grove, and rehabilitation of the historic terrain of Cemetery Ridge and Ziegler's Ravine. "These actions continue to help us meet our goals of improving the integrity of the battlefield landscapes and improving our visitors' understanding of what happened at Gettysburg and why it's so important," said Rick Kendall, Gettysburg National Military Park. Historians believe distinctive geometric fortresses may have been built by Sweyn Forkbeard as a military training camp from which to launch his invasion of England.Archaeologists in Denmark have discovered a distinctive ring-shaped Viking fortress which historians believe may have been used to launch an invasion of England. The fortress found on the Danish island of Zealand, around 30 miles south of Copenhagen, is the fifth circular fortress to be unearthed, and the first in over 60 years. “This is great news,” said Lasse Sonne, a Viking historian from the Saxon Institute at the University of Copenhagen. “Although there were Vikings in other countries, these circular fortresses are unique to Denmark. Many have given up hope that there were many of them left.” Like previously discovered ring fortresses, the Vallø Borgring is thought to date back to the late tenth century and the reign of Harald Bluetooth, the king who Christianised Denmark and Norway. However, some historians contend the fortresses were constructed by his son Sweyn Forkbeard, the first Danish King of England, as a military training camp or barracks from which to launch his invasions of England. Sweyn Forkbeard seized London in 1013 and was declared King of England on Christmas Day of that year. The newly discovered fortress has a diameter of 475 feet, making it the third-largest of its type, and consists of a 35-foot wide circular rampart surrounded by a palisade of wooden spikes. Although only small portions of the new fortress have been uncovered, it appears to match the design of Denmark’s other ring fortresses, sticking to a strict geometric pattern. The fortresses have four gates facing outward in different compass directions, and an interior courtyard symmetrically divided into four quarters. It is thought that Viking “longhouses” would have been constructed within the fortress. Historians believe the geometric design may have been inspired by old Roman army camps found by Vikings during their raids on England.Denmark’s ring fortresses are also known as Trelleborgs, after the location of the first to be discovered in western Zealand. The other three are located in Aggersborg and Fyrkat in northern Jutland, and Nonnebakken near Odense.